Albufeira is a beautiful seaside town, located on the Atlantic ocean in the Algarve region in the south of Portugal. With a Long Stay you'll feel you have a home away from home with all the amenities needed to relax and enjoy life abroad. 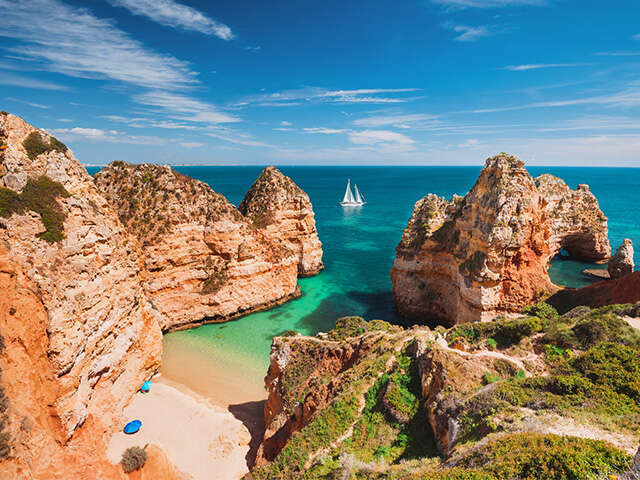 You will also have a local representative available who will provide information and help you arrange optional excursions around the area such as local markets, wine & olive oil tasting tours and other excursions around the Algarve, Portugal and Spain. Lisbon After your time in the Algarve, spend 2 nights at a 4-star hotel in Lisbon and explore this charming, colourful city with an included tour. Supplier Terms and conditions: Prices shown are per person, accommodation in a studio in double occupancy, flights on our group allotments (Air France, KLM) and according to availability for any other Canadian departure city. Prices were accurate at press time (Mar 13, 2019); they are applicable to new bookings only and are subject to change according to the availability of flights upon reservation. Quantity limited for flights and rooms. No group seat allotment blocked , price can change according to availability and are subject to change. All departures dates are available from every Canadian city. Price is on request according to availability at reservation. Taxes of $690 are included | Supplements One-bedroom apartment +$ 200 | Pool view double + $85 to +$170 | studio single from + $800. NOTE: Seat selection and deviations are not possible prior to departure on our group seat blocked. Not included: Seat selection in advance is not possible with this Group promotional price, travel insurance, meals and all other item not mentioned. For full terms and conditions visit www.exotikjourneys.com.